Photographs of life in the rebel-held areas of Idlib province and Hama province as Syria's civil war trudges into its third year. 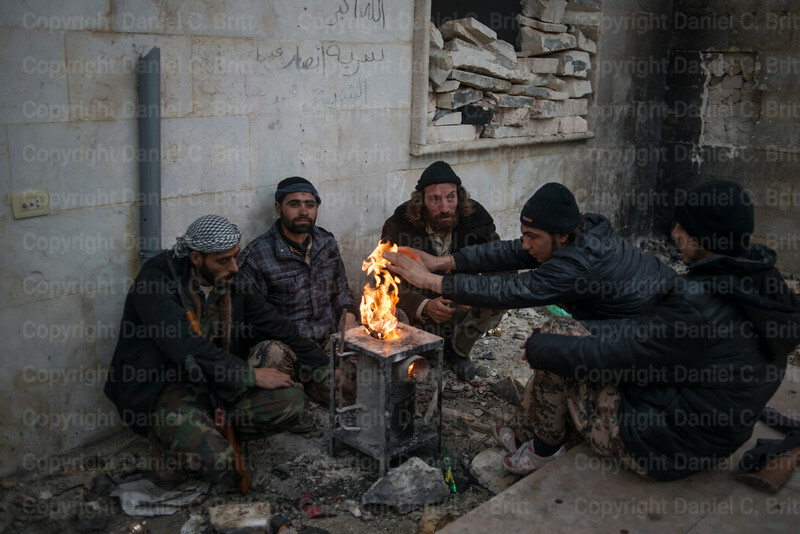 L-R Abdul Kareem, Hameed Obsi, Abu Mohammed, Khalid Haloof and Ala Khushem joke with each by a fire on the frontline in Marat al-Nouman, Syria, on Tuesday, December 3, 2013. 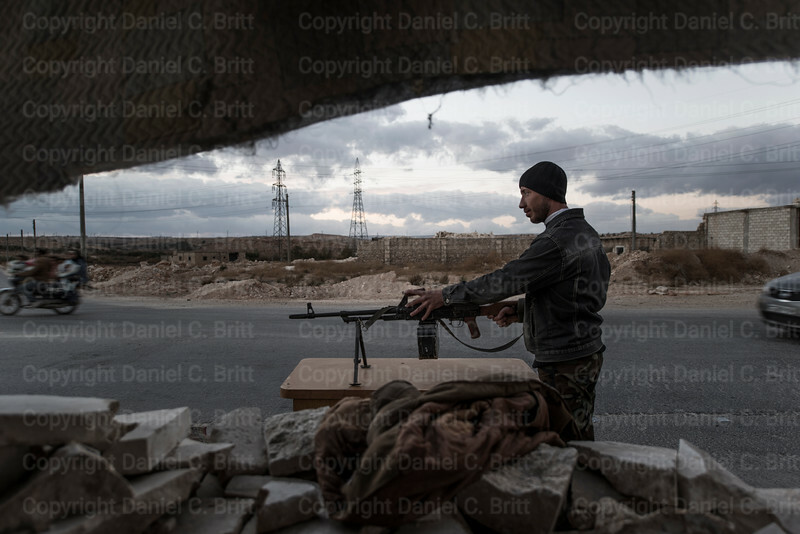 As the Syrian civil war approaches its third year, holding the the city from recapture by government forces means rebels engage in daily sniper battles while enduring airstrikes and the cold weather. 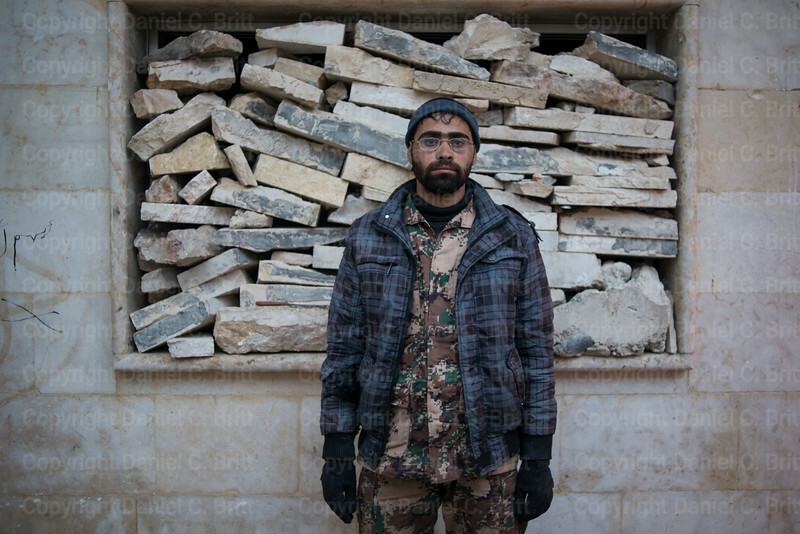 Hameed Obsi, a rebel fighter, poses for a photo on the frontline in Marat al-Nouman, Syria, on Tuesday, December 3, 2013. 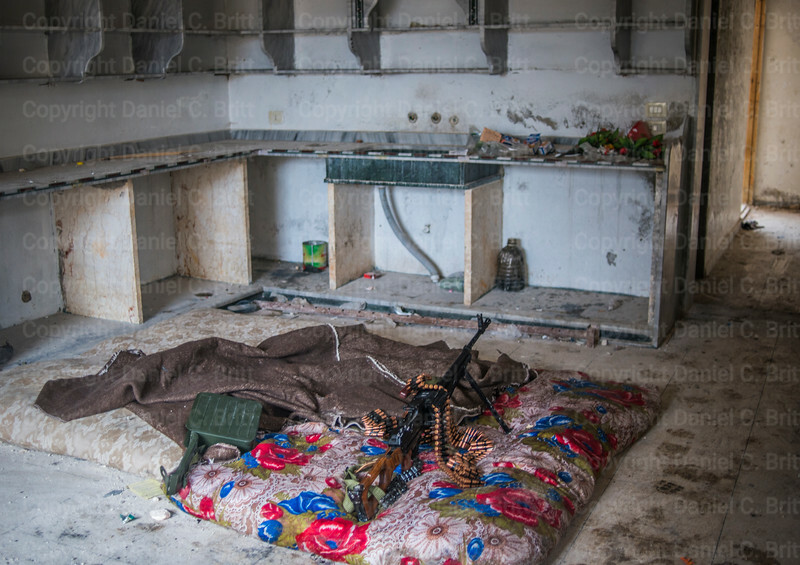 A heavy machine gun sits on a sleeping mat in a rebel outpost on the frontline in Marat al-Nouman, Syria, on Tuesday, December 3, 2013. Rebels sleep and fight in shifts. 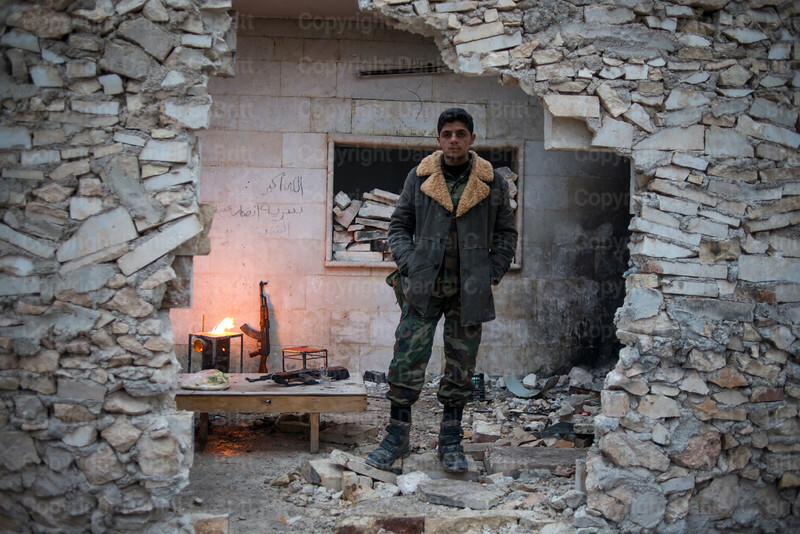 Abdul Kareem poses for a photo on the frontline in Marat al-Nouman, Syria, on Tuesday, December 3, 2013. 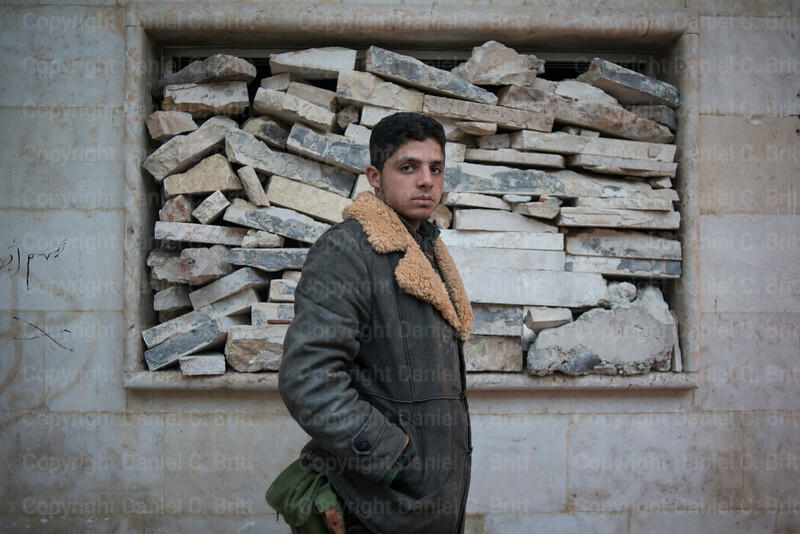 Hamed al-Jakmoro, 21, a rebel fighter, poses for a photo on the frontline in Marat al-Nouman, Syria, on Tuesday, December 3, 2013. 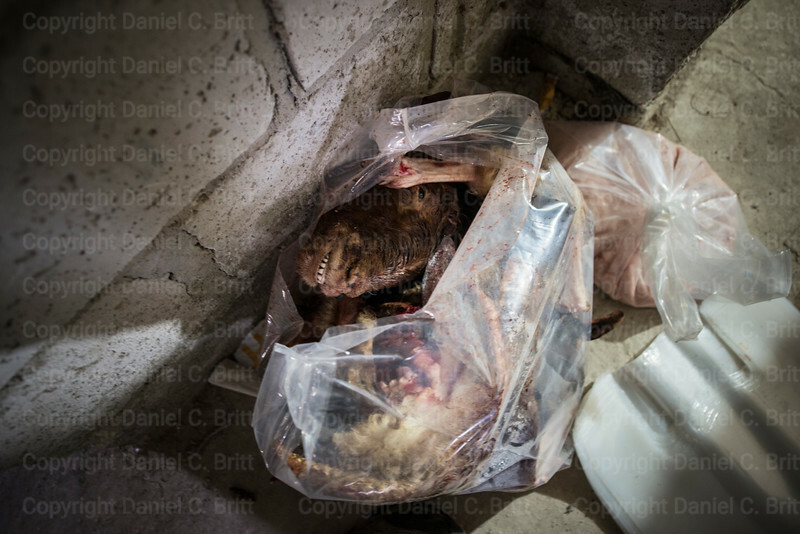 The remains of a sheep butchered for donation to local families in Kafranbel, Syria, on Friday, November 1, 2013. 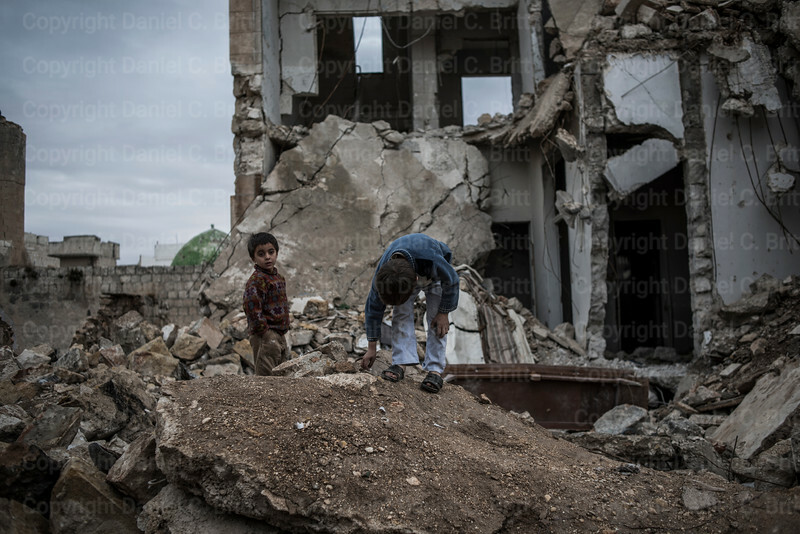 Kids wander in the wreckage in Marat al-Nouman, Syria, on Wednesday, December 4, 2013. 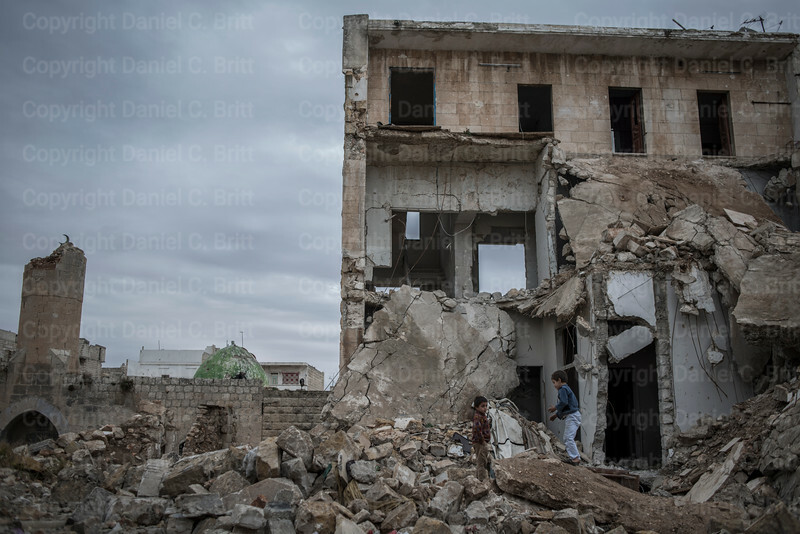 Government airstrikes and shelling have destroyed most of the city. 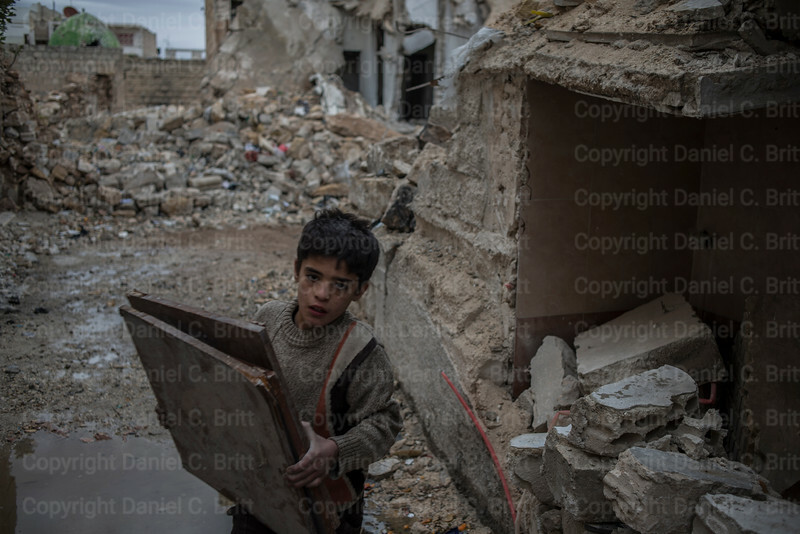 A boy carries wood for burning from the wreckage in Marat al-Nouman, Syria, on Wednesday, December 4, 2013. 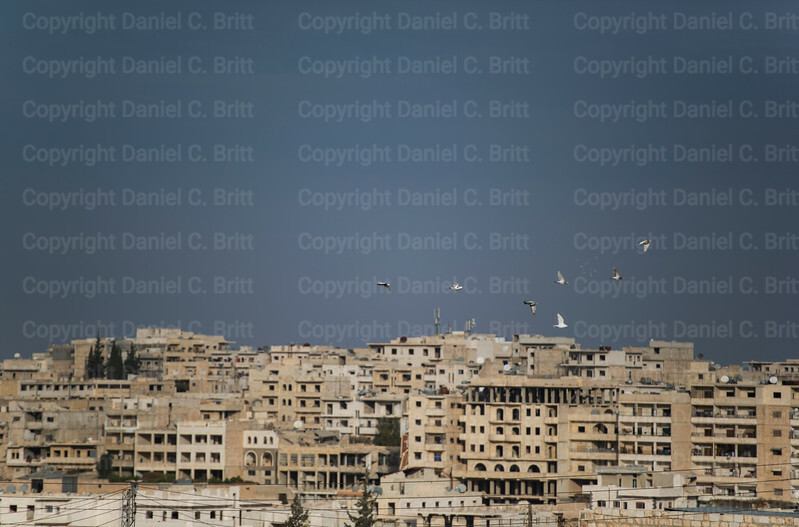 Government airstrikes and shelling have destroyed most of the city. As winter sets in, civilians are left without adequate shelter or blankets. 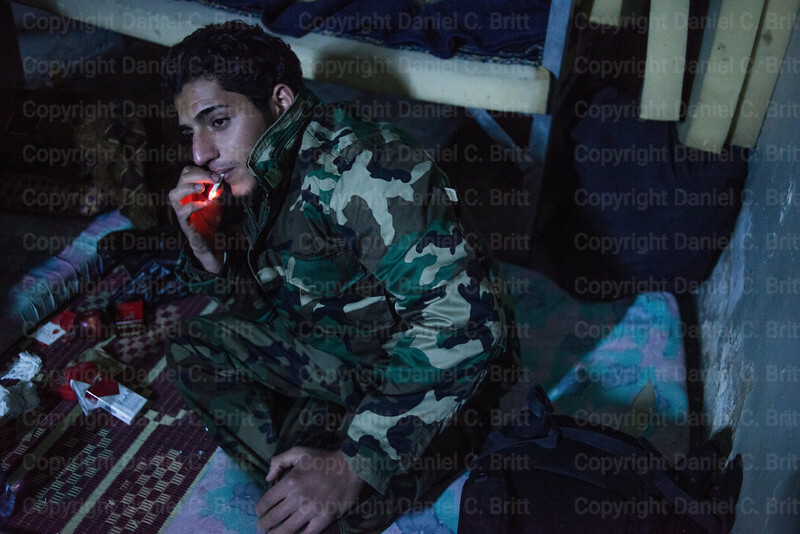 Shadi Abided, a rebel fighter, smokes to keep warm in a rebel barracks in Marat al-Nouman, Syria, on Wednesday, December 4, 2013. 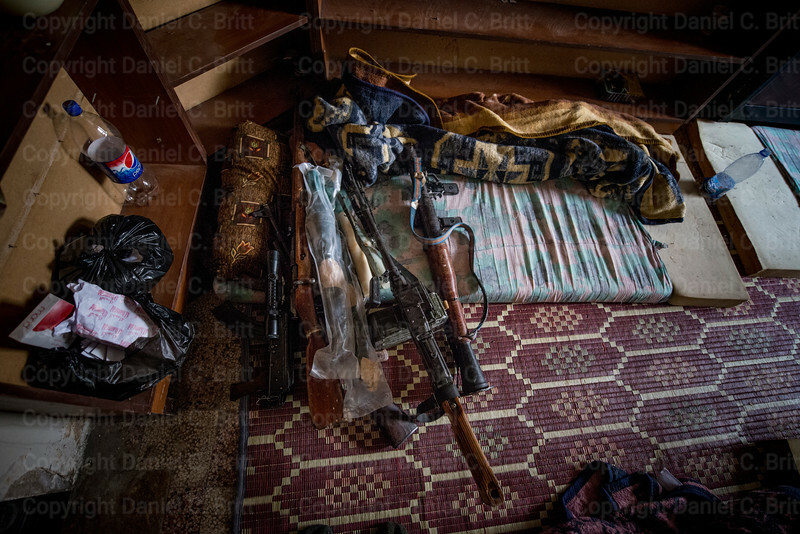 A rocket launcher and a heavy machine gun sit in a rebel hideout Marat al-Nouman, Syria, on Saturday, December 7, 2013. 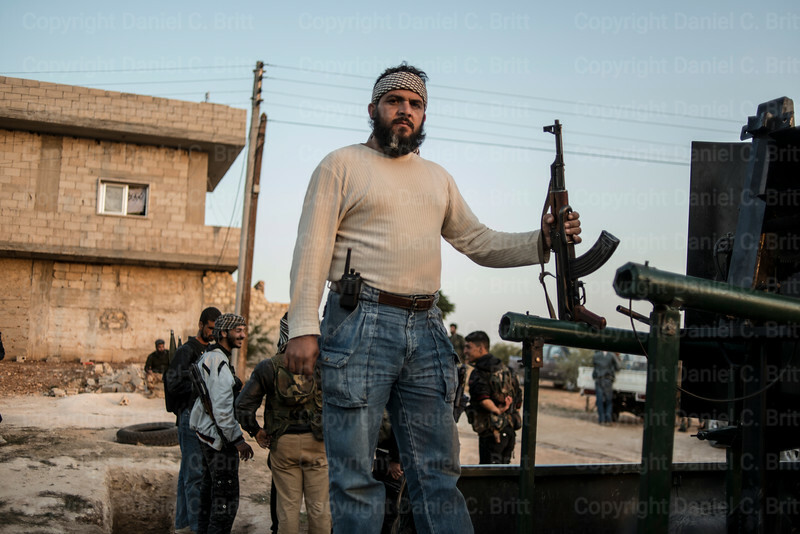 Humanitarian aid worker Layth al-Midani drives through a checkpoint held by al-Qaeda-linked militants in Syria's Idlib province on Monday, December 9, 2013. Al-Midani travels covertly under the protection of secular rebels. Extremist groups fighting alongside, and, often, against more secular native Syrian rebels, are responsible for dozens of kidnappings and killings. International aid workers and journalists are prime targets. Less than a week before this trip, an Iraqi freelance journalist was shot to death at a checkpoint less than 30 km from the Turkish border. 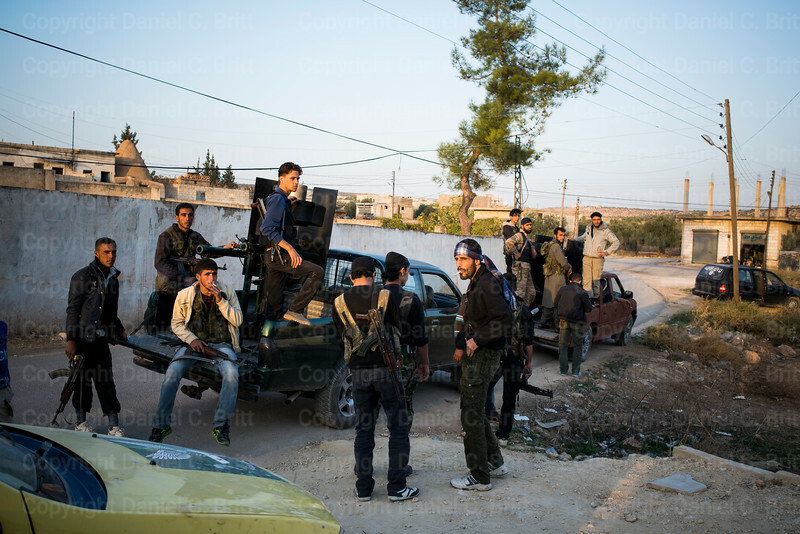 Rebel fighters ride to battle in a pick-up truck in Syria's Hama province on Thursday, October 31, 2013. Though less battle-ready than those in Syria's cities, rural fighters enter firefights ready to die. Rural brigades often sacrifice training to save money on bullets. Smoke from mortar shells rises along a country road on the outskirts of Syria's Hama province on Friday, November 1, 2013. 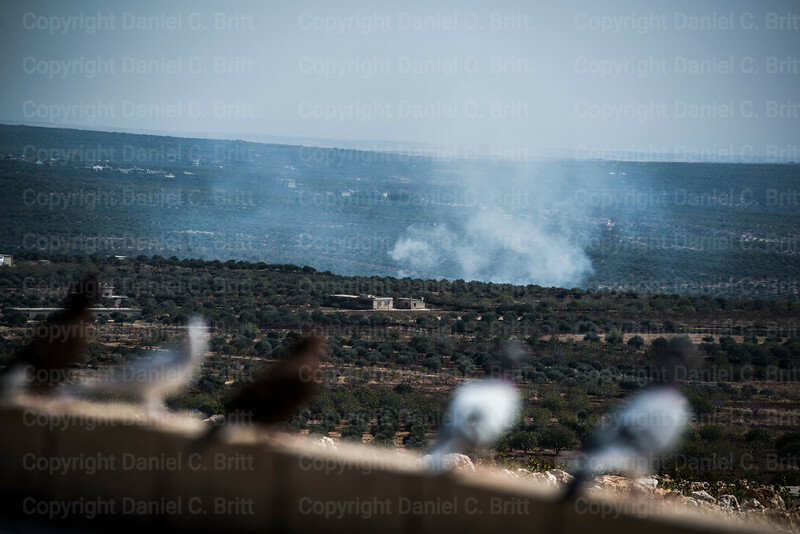 Shelling and airstrikes batter the landscape several times a day. 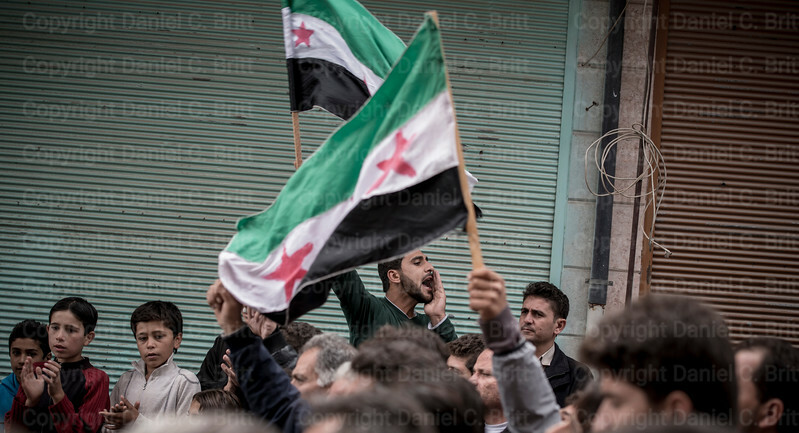 Abdullah Salom, 25, leads a chant against the Syrian government in the village center in Krafanbel, Syria, on Friday, October 18, 2013. 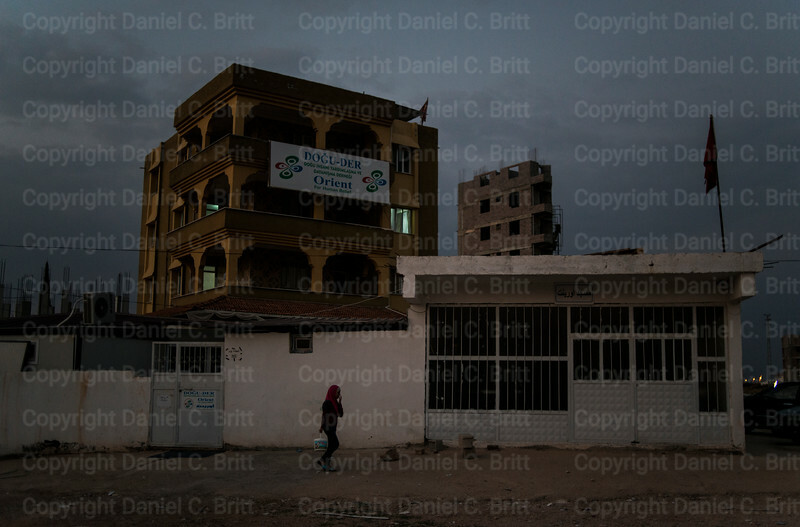 As the war approaches its third year, bombs continue to fall on the rebel-controlled town several times a week. 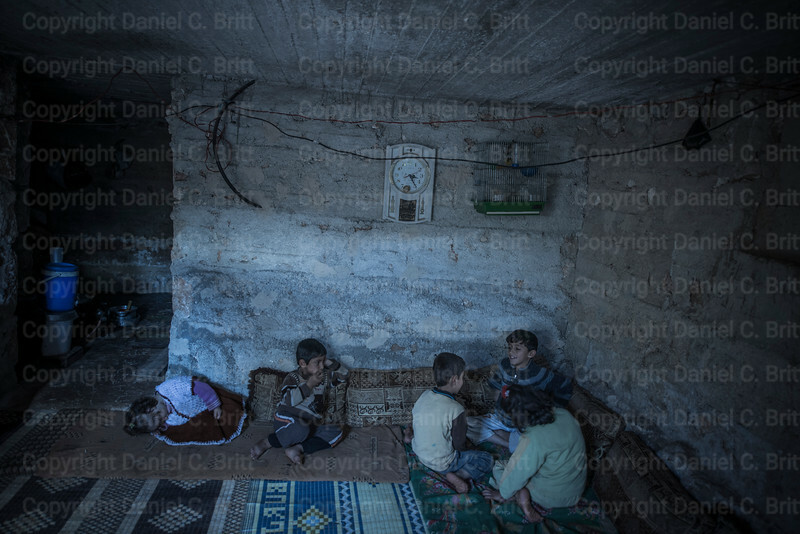 Rasha Ali Kabalari, 4, left, shuts down in a bomb shelter at the sound of an approaching airplane in Kafranbel, Syria, on Saturday, October 19, 2013. Repeated bombings by government forces have resulted in post-traumatic stress for much of the village, including hundreds of children. There are no facilities in Kafranbel to treat PTSD and rural Syrians tend to view the disorder as a passing phase or a sign of personal weakness. Awad Abdul Rahman, 39, poses in Marat al-Nouman with this prosthetic leg on Monday, October 21, 2013. Rahman lost his leg to an artillery round in an operation on July 2. Four weeks later, he returned to the rebel front. "We have to fight. Assad's massacres are ending. We smile despite all our wounds." 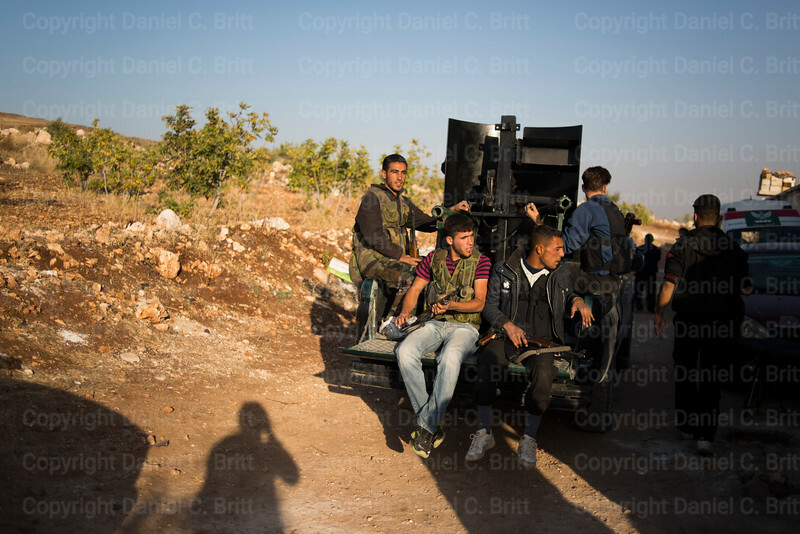 A group of rebel fighters pose for a photo in Idlib province, Syria on Monday, October 21, 2013. Youtube and social media are an integral part of bolstering morale for these fighters who plan to post this picture, one of three poses, on their Facebook pages. 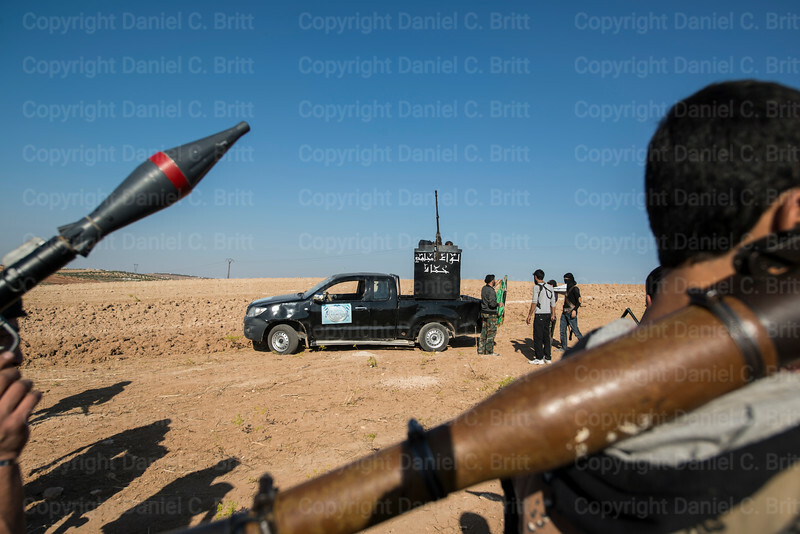 Men with rocket propelled grenades walk passed a truck loaded with a heavy machine gun in a field in the outskirts of Hama province, Syria, on Monday, October 28, 2013. The group was part of a gathering of about 100 rebel fighters from eight brigades who announced plans to unite to form a new force called "Liwaa Mujahideen Hama" or "Brigade of Fighters in Hama." At the meeting, LMH officials said the coalition would be able to organize safe passage for aid workers throughout Hama. Fighters compared weapons and socialized. Close to 100 fighters from eight rebel brigades gathered in a field in the outskirts of Hama province, Syria, on Monday, October 28, 2013 promising to open routes for humanitarian aid in the province. The rebels announced they were uniting to form a new force called "Liwaa Mujahideen Hama" or "Brigade of Fighters in Hama." At the meeting, LMH officials said the coalition would be able to organize safe passage for aid workers throughout Hama. Fighters compared weapons and socialized. 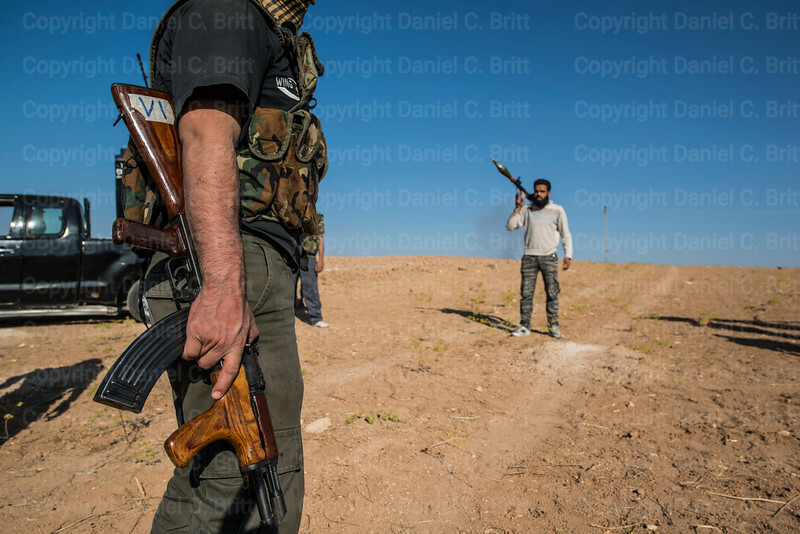 Two Syrian rebels brandish weapons in a field in the outskirts of Hama province, Syria, on Monday, October 28, 2013. The pair were a part of a gathering of about 100 fighters from eight local brigades who announced they were uniting to form a new force called "Liwaa Mujahideen Hama" or "Brigade of Fighters in Hama." At the meeting, LMH officials said the coalition would be able to organize safe passage for aid workers throughout the province. Fighters compared weapons and socialized. 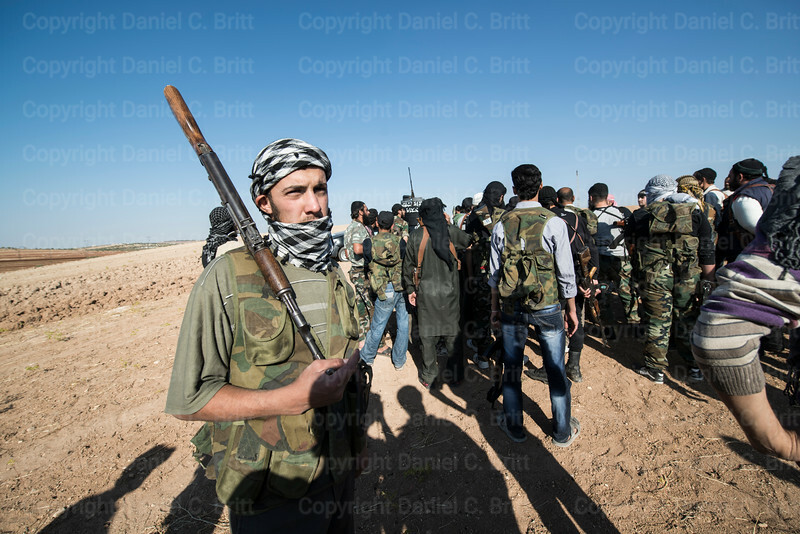 Close to 100 fighters from eight rebel local brigades gathered in a field in the outskirts of Hama province, Syria, on Monday, October 28, 2013 promising to open routes for humanitarian aid in the province. The rebels announced they were uniting to form a new force called "Liwaa Mujahideen Hama" or "Brigade of Fighters in Hama." At the meeting, LMH officials said the coalition would be able to organize safe passage for aid workers throughout the province. Fighters compared weapons and socialized. 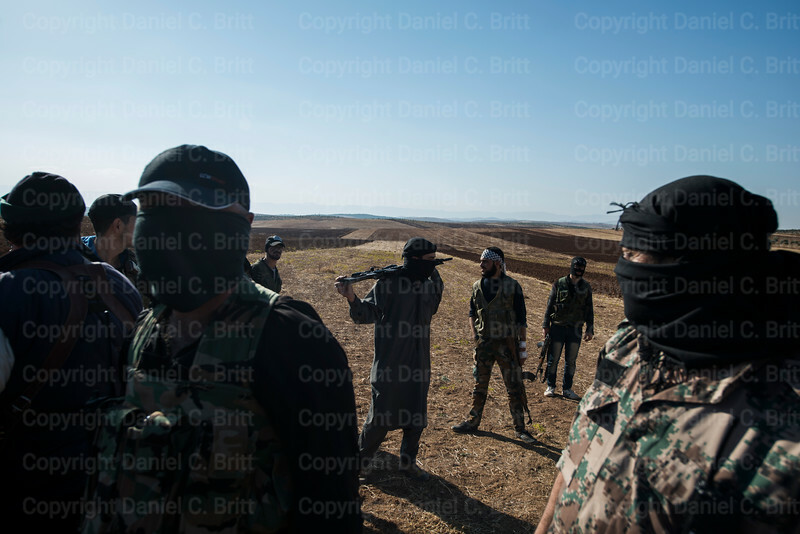 Close to 100 fighters from eight rebel brigades gathered in a field in the outskirts of Hama province, Syria, on Monday, October 28, 2013, promising to open routes for humanitarian aid in the province. The rebels announced they were uniting to form a new force called "Liwaa Mujahideen Hama" or "Brigade of Fighters in Hama." At the meeting, LMH officials said the coalition would be able to organize safe passage for aid workers throughout Hama. Fighters compared weapons and socialized. 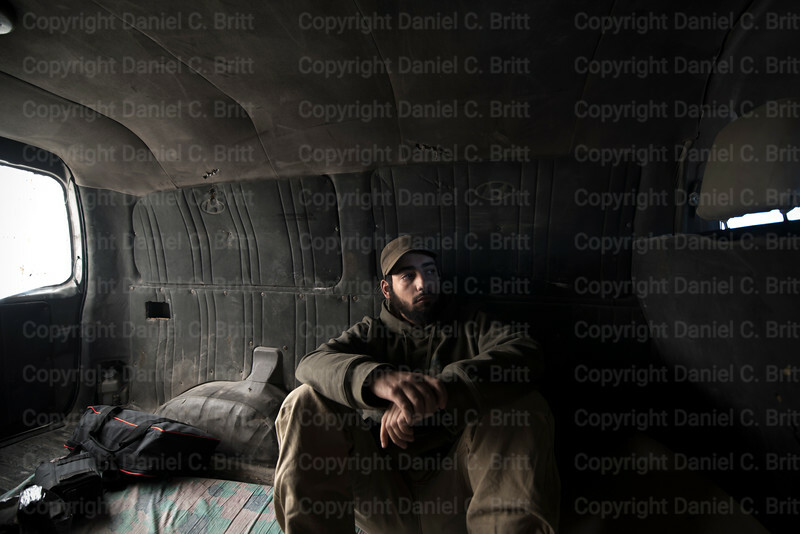 Rebel fighters leave for a long operation in Syria's Hama province in a pick-up truck on Thursday, October 31, 2013. 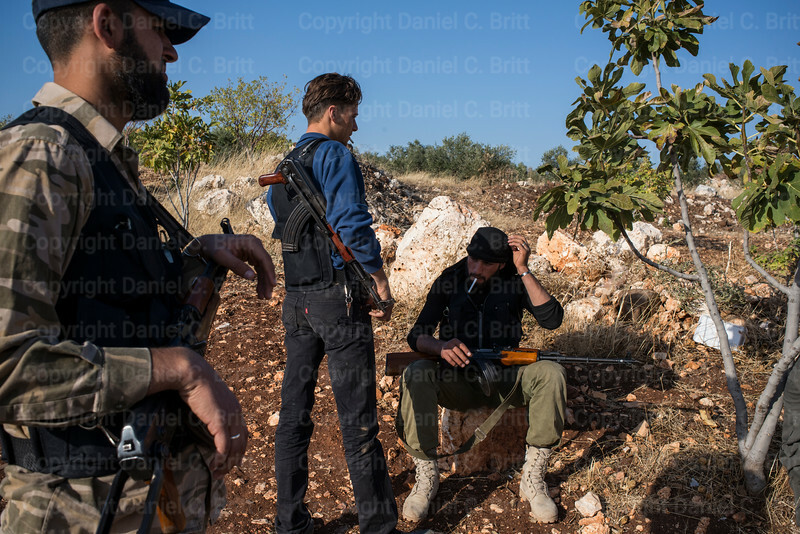 Though less battle-ready than those in Syria's cities, rural fighters enter firefights ready to die. Rural brigades often sacrifice training to save money on bullets. 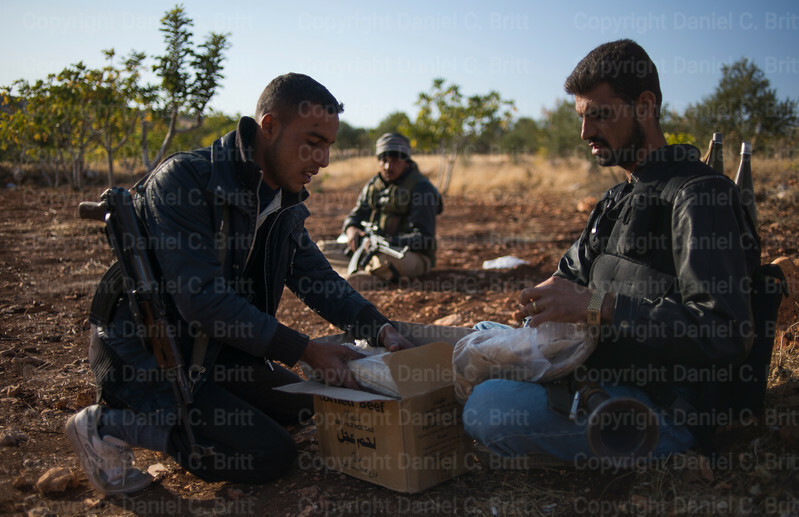 Rebel fighters pack flat bread before a long operation in Syria's Hama province on Thursday, October 31, 2013. The rolling landscape offers little cover during operations in rural areas which makes recovering the wounded difficult. Though less battle-ready than those in Syria's cities, rural fighters enter firefights ready to die. Rural brigades often sacrifice training to save money on bullets. 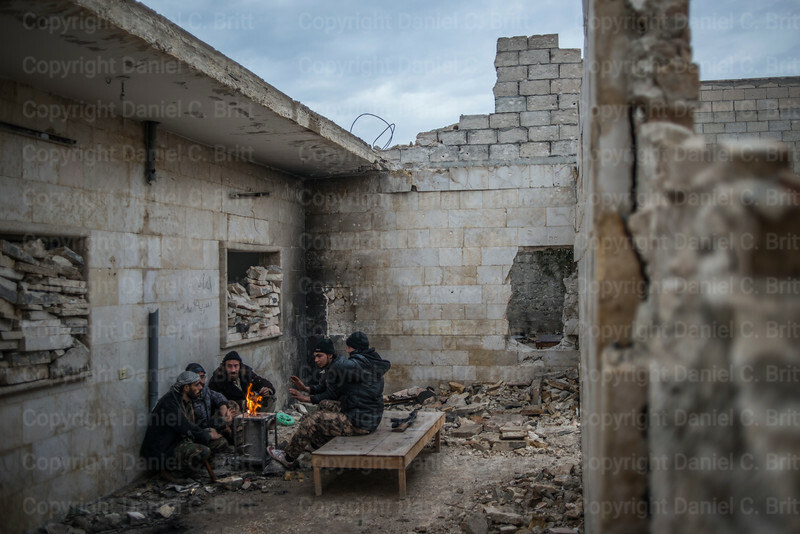 Rebel fighters stop for a cigarette break in Syria's Hama province on Thursday, October 31, 2013. Though less battle-ready than those in Syria's cities, rural fighters enter firefights ready to die. Rural brigades often sacrifice training to save money on bullets. 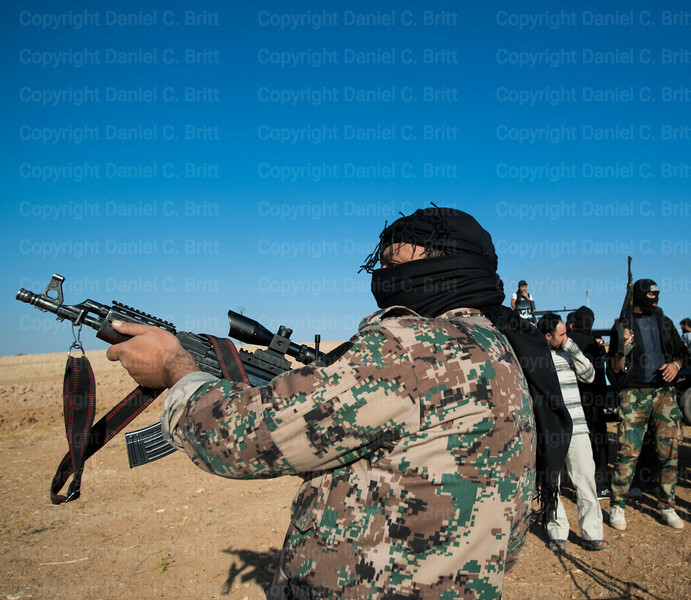 Rebel fighters gather to prepare weapons in Syria's Hama province on Thursday, October 31, 2013. Though less battle-ready than those in Syria's cities, rural fighters enter firefights ready to die. Rural brigades often sacrifice training to save money on bullets. 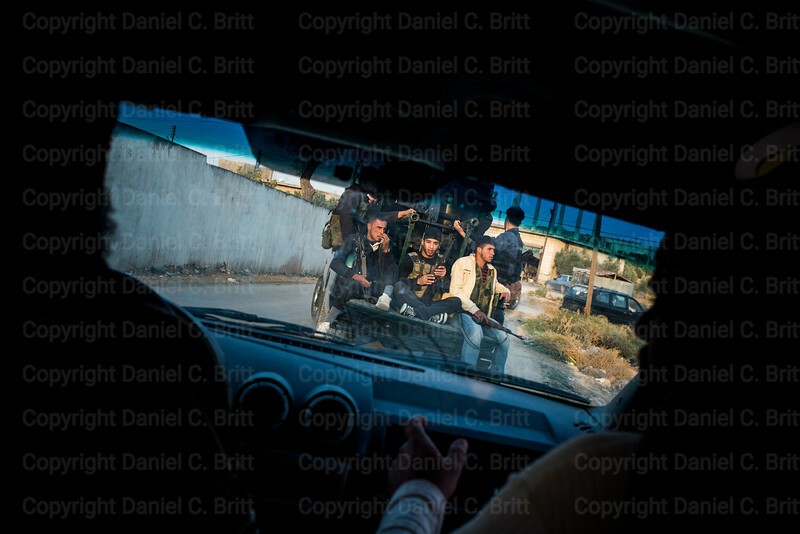 Rebel fighters ride to the front in a pick-up truck in Syria's Hama province on Thursday, October 31, 2013. Though less battle-ready than those in Syria's cities, rural fighters enter firefights ready to die. Rural brigades often sacrifice training to save money on bullets. 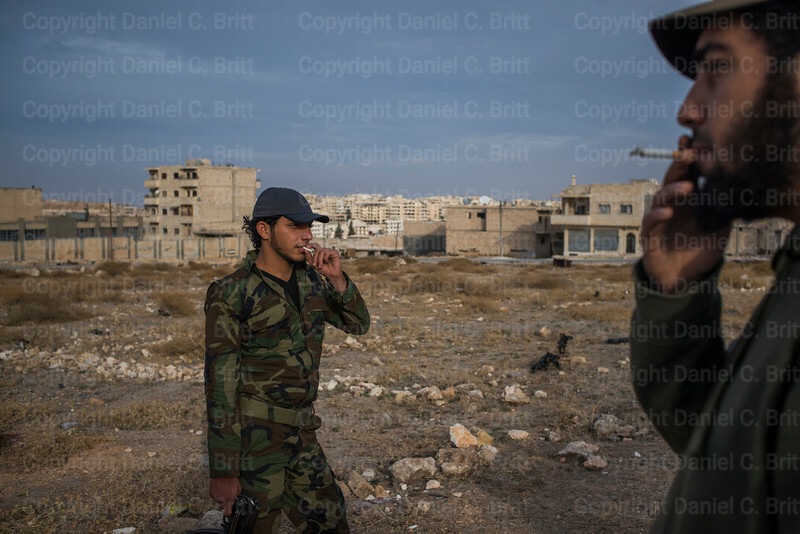 Rebel fighters take a cigarette break in Syria's Hama province on Thursday, October 31, 2013. Though less battle-ready than those in Syria's cities, rural fighters enter firefights ready to die. Rural brigades often sacrifice training to save money on bullets. 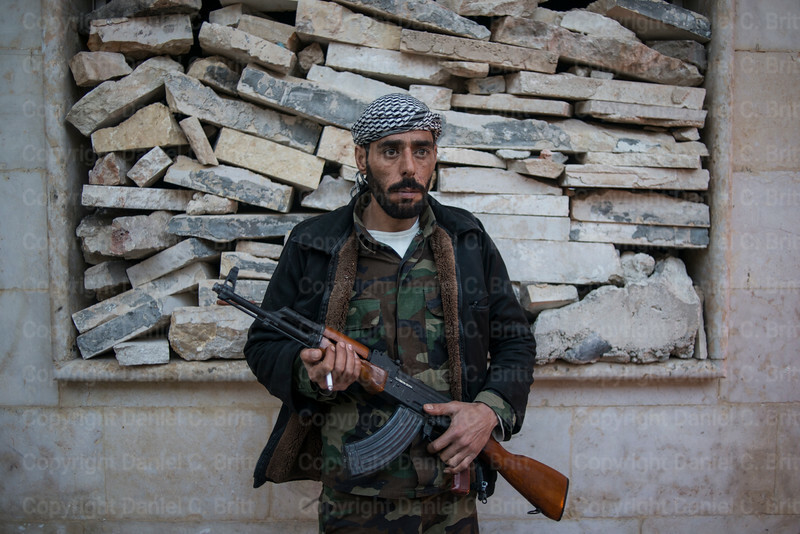 Abu Wasel poses for a photo in Syria's Hama province on Thursday, October 31, 2013. Though less battle-ready than those in Syria's cities, rural fighters enter firefights ready to die. Rural brigades often sacrifice training to save money on bullets. 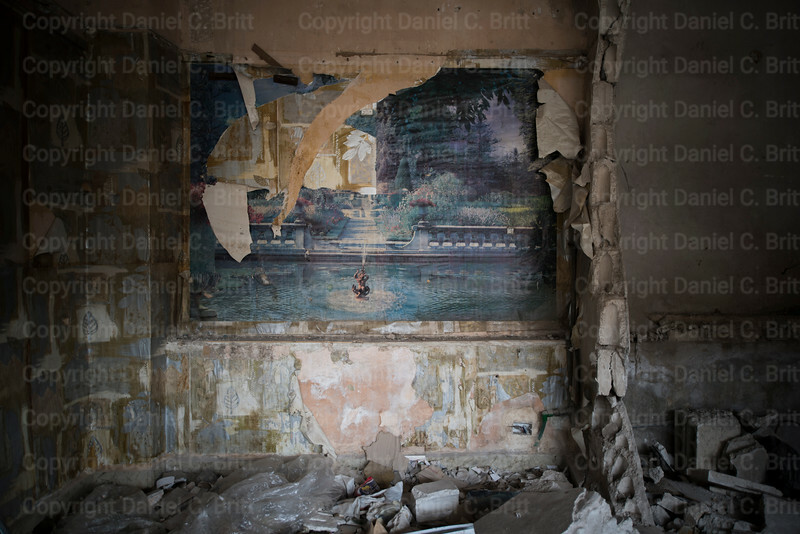 A mural lies in ruin in a building destroyed in an air strike in Krafanbel, Syria on Friday, October 18, 2013. As the war approaches its third year, bombs continue to fall on the rebel-controlled town several times a week. A woman walks passed a dimly lit Orient Hospital in Reyhanli, Turkey on Saturday, November 9, 2013. The Turkish government has shut down several of the hospital's satellite clinics which have been treating patients, mostly war-wounded Syrians from the nearby border, without licensure. Shadi Abdeed, 20, left and Layth al-Midani smoke cigarettes in a lot used as a staging area for antiaircraft guns in Marat al-Nouman, Syria, on Sunday, December 1, 2013. Daily government airstrikes have rebels watching the sky on 24-hour alert. The sound of a jet pushes a group of birds through the grey sky over Marat al-Nouman, Syria, on Sunday, December 1, 2013. Daily government airstrikes have rebels watching the sky on 24-hour alert. 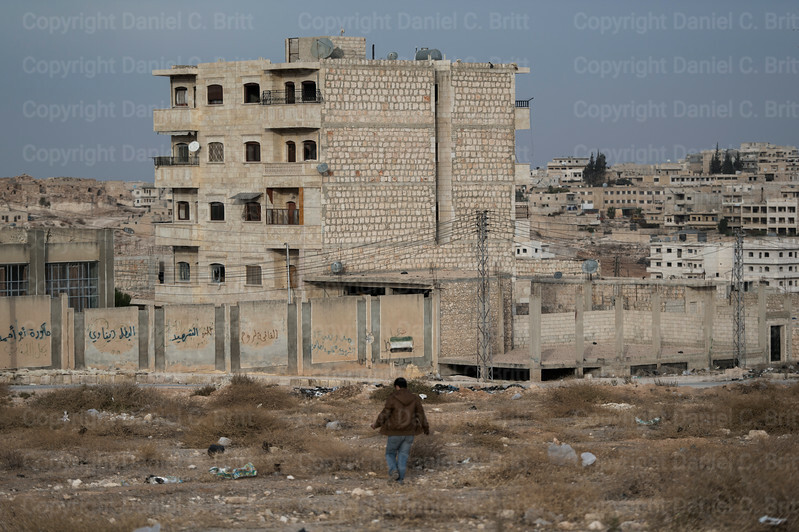 A man crosses a field in Marat al-Nouman, Syria, on Sunday, December 1, 2013. Daily government airstrikes have rebels watching the sky on 24-hour alert. 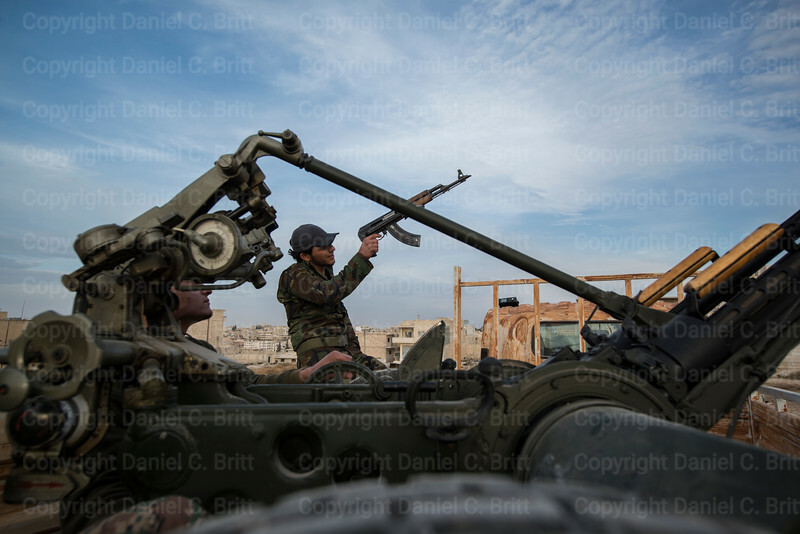 In the back of a truck equipped with an anti-aircraft gun, Shadi Abdeed scans the sky for incoming planes with his rifle site in Marat al-Nouman, Syria, on Sunday, December 1, 2013. Daily government airstrikes have rebels watching the sky on 24-hour alert. 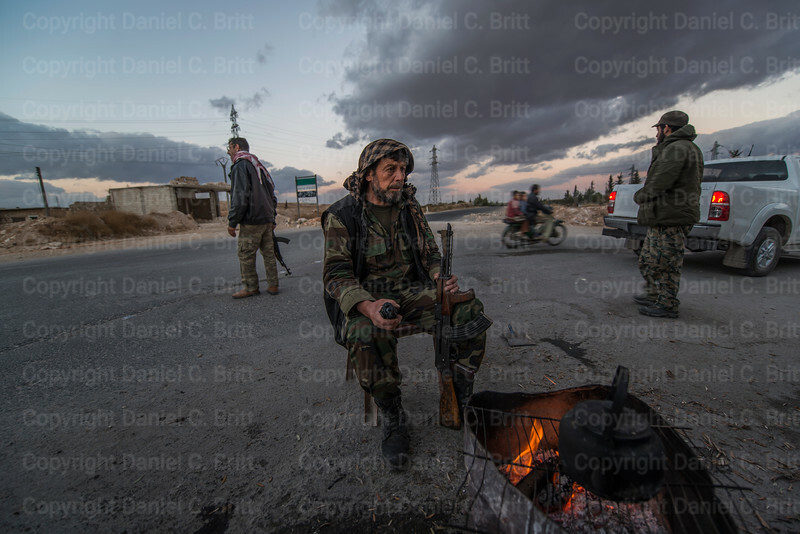 Abdul Kahghel man warms himself by a small fire at a rebel checkpoint in Marat al-Nouman, Syria, on Friday, November 29, 2013. 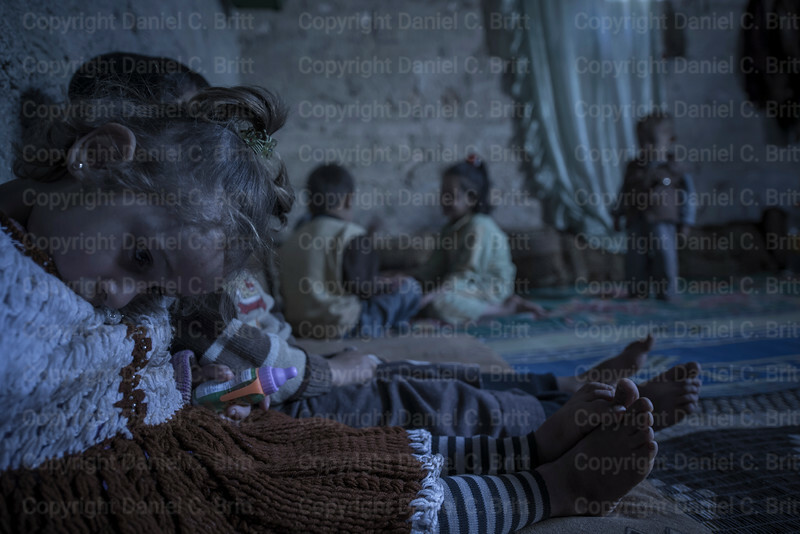 As winter cold settles in Syrian rebels and civilians alike find themselves without heat and adequate blankets. 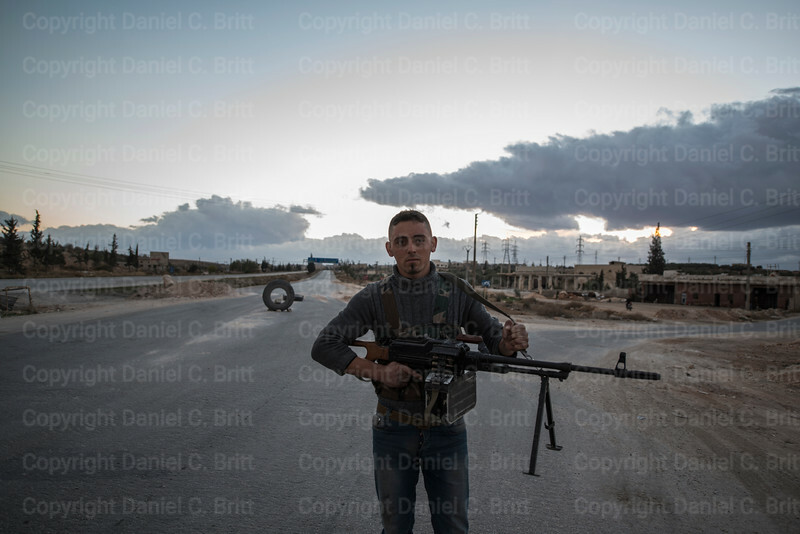 Rebel fighter Hamed Shaeed poses with a heavy machine gun at a rebel checkpoint in Marat al-Nouman, Syria, on Friday, November 29, 2013. 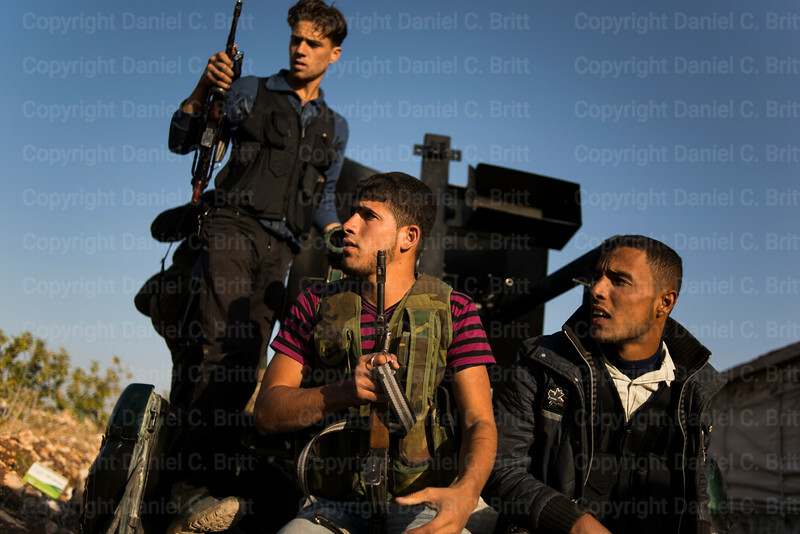 Ha-el Koshan mans a heavy machine gun at a rebel checkpoint in Marat al-Nouman, Syria, on Friday, November 29, 2013. 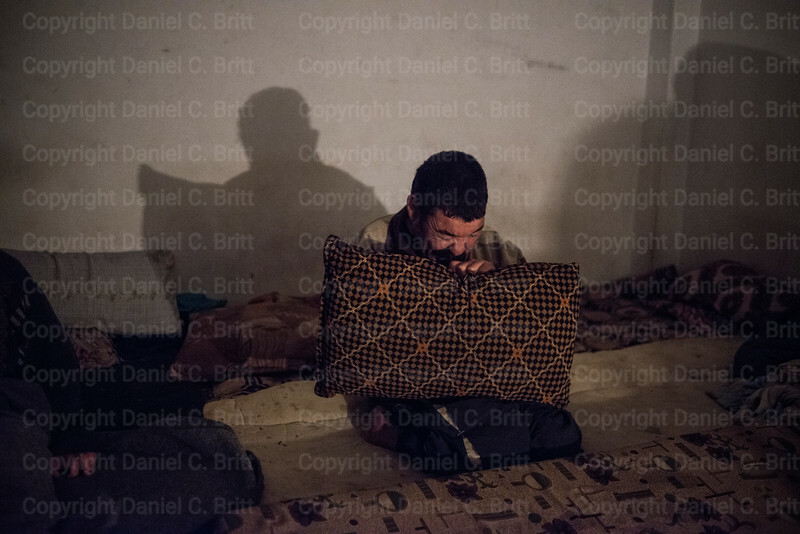 Saleh al-Tezeri, a mentally disabled man, reacts to the sound of shelling outside his home in Marat al-Nouman, Syria, on Wednesday, December 4, 2013. 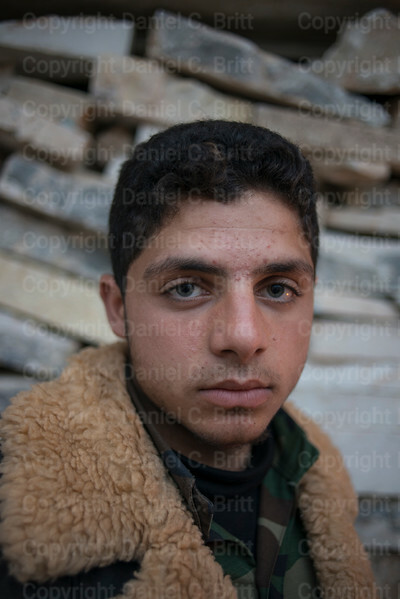 Saleh is one of four disabled men in his 20-person family. As winter cold settles in, Syrian civilians find themselves without food, heat and adequate blankets. The al-Tezeris also face a lack of medication for their disabled family members. 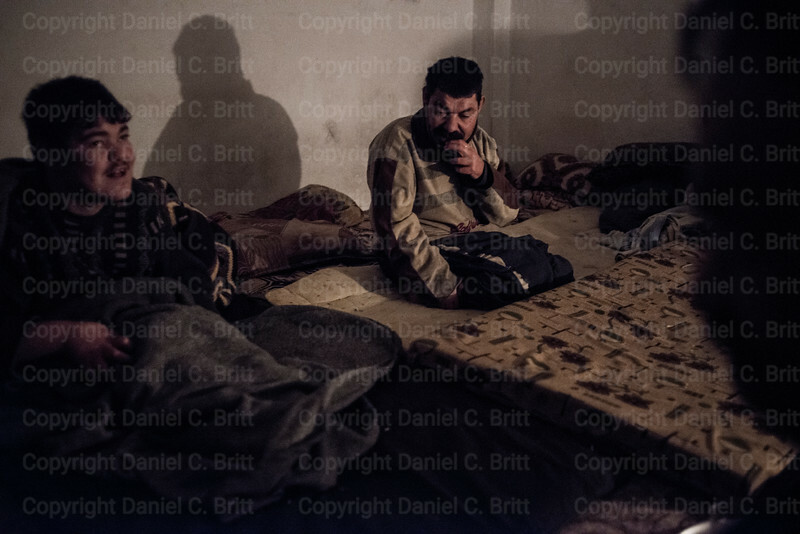 L-R, Hisham al-Tezeri, Saleh al-Tezeri, and Ahmed al-Tezeri, mentally disabled men, sit in their home in Marat al-Nouman, Syria, on Wednesday, December 4, 2013. They are three of the four disabled men in their 20-person family. As winter cold settles in, Syrian civilians find themselves without food, heat and adequate blankets. The al-Tezeris also face a lack of medication for their disabled family members. Grave keepers Amron Mara, 14, and Maron Saeda, 22, rest after surveying the cemetery in Marat al-Nouman, Syria, on Tuesday, December 3, 2013. The morning mortar attack, which fell heavily on the graveyard, destroyed several burials. 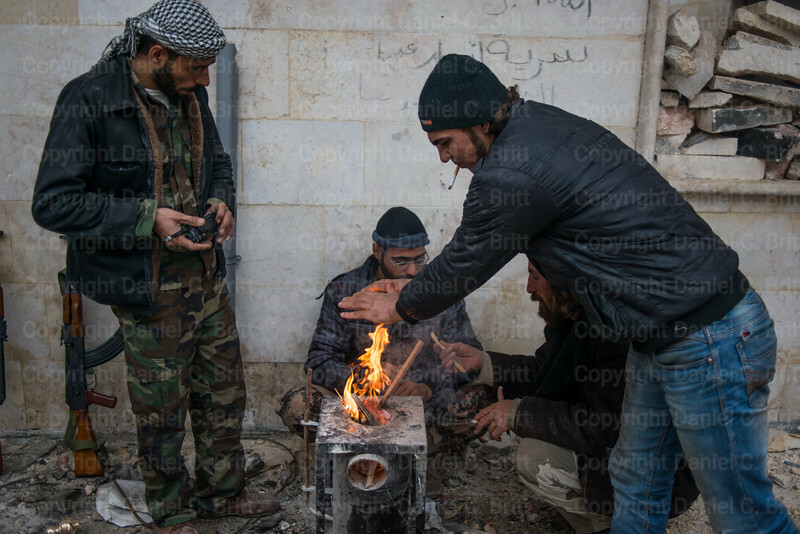 Khalid Haloof, 18, warms his hands on a fire on the frontline in Marat al-Nouman, Syria, on Tuesday, December 3, 2013. As the Syrian civil war approaches its third year, holding the the city from recapture by government forces means rebels engage in daily sniper battles while enduring airstrikes and the cold weather. 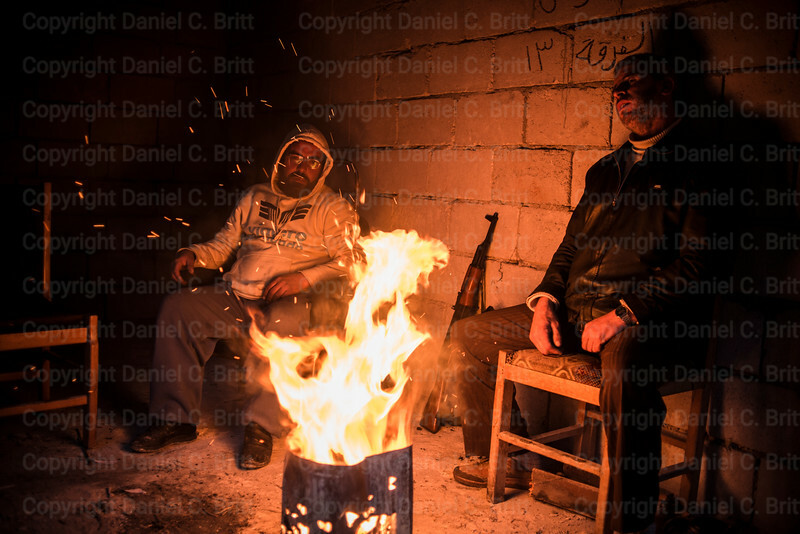 Mohammed Hamaidi, left, and Mohammed Tihauz, rebel fighters, sit by a fire while standing watch over a rebel outpost in Marat al-Nouman on Tuesday, December 3, 2013. 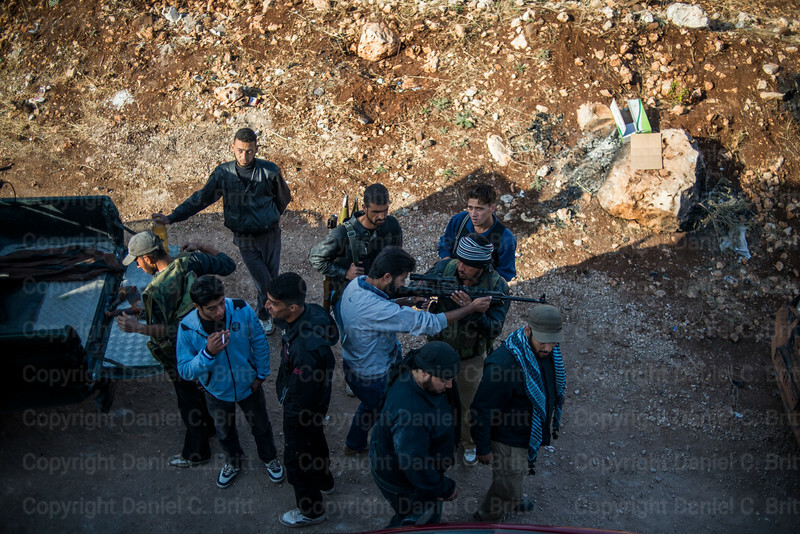 The winter fighting season meets rebels without adequate heat or blankets.